Just a reminder of two big events coming up this week, both of which I am really excited about. 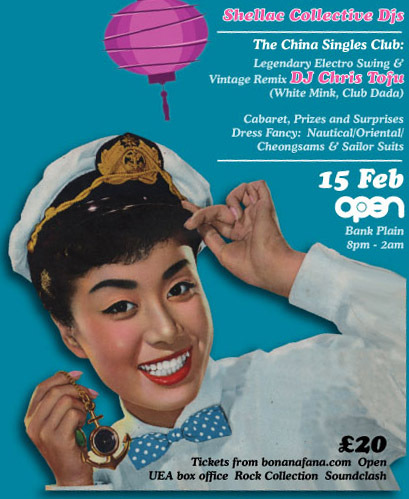 Bo Nanafana always put on a special and spectacular show and this is sure to continue with Saturday’s Valentine’s event which is themed as The Slow Boat to China, so dress nautical, oriental, vintage, or just come along and have a great time and see how amazing people look and dance. Tickets are great value at £20, for this there are usually a couple of bands, various DJs in a number of rooms, including the wonderful Shellac Collective, some swing dance lessons, cabaret, and so much more. I usually find it is a bit like a mini-festival in that there are things going on all over the place – not just the main stages, some things I will inadvertently miss in hidden rooms whilst I also stumble upon hidden gems in others. It really is a packed event with something happening all over in the large and beautiful OPEN venue. Bo nights are amongst my absolute highlights of the year, they are really special and we are incredibly lucky to have them, increasingly the rest of the country has become rather envious of what Bo Nanafana do and bring to Norwich, the NYE bash was listed as one of the top events not just in the country but internationally by one magazine. Tickets £20 from OPEN, Bo Nanafana, UEA Box Office, Soundclash, and Rock Collection. Before that though is the official launch for the amazing new Wooden Arms double A side single with a double A side gig alongside Heart of a Dog. Cove Hithe (formely Brother the Wolfe) shall also be playing. 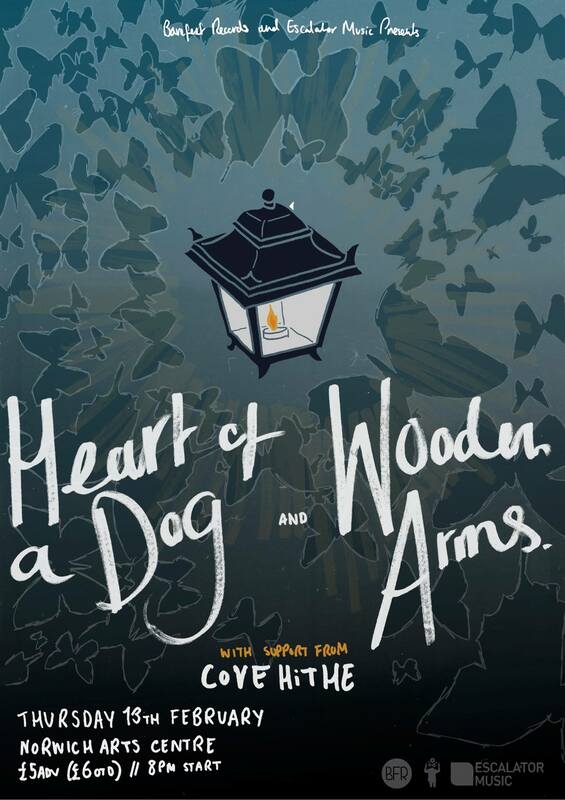 Heart of a Dog recently released what in my view is probably their best work so far in HOSS, and now Wooden Arms have created something of similar beauty. My CD of the single arrived today, packaged in a gorgeous sleeve and the tracks Tide, and December are just sublime. December in particular is immensely gorgeous and wonderfully performed and produced. Jeff’s singing on this is just astounding, whilst backing vocals float around the sumptuous playing of the strings and Alex’s piano, whilst Jeffrey also has a trumpet solo. Amazing stuff, it will sound magnificent in the Norwich Arts Centre. The last time I saw them play a friend of mine happened to wander into the Cinema City bar where they were playing and he was hearing them for the first time, so I bought him the previous EP. I bumped into him at the weekend and he told me he can’t stop playing it and is also looking forward to this gig. This entry was posted in bands and new releases, Bo Nanafana, Norwich Arts Centre, Wooden Arms and tagged bare feet records, bfr, bo nanafana, bo nanafana social club, bonanafana, Cove Hithe, heart of a dog, norwich arts centre, open, wooden arms. Bookmark the permalink.